While the idea of Henry Rollins being the lovelorn roommate of Glenn Danzig is always good for a chuckle, the iconic Black Flag frontman recently revealed a real-life celebrity encounter with much more chilling implications. On December 9, Rollins took the stage at Los Angeles's Echoplex to host a benefit for the KCRW radio station and, in the process, dropped some tantalizing information: he produced a full album with notorious convicted fellon Charles Manson. 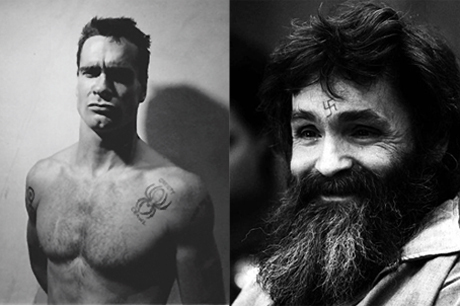 According to the Hollywood Reporter, Rollins helped produce a collection of Manson's pop songs while he was living at the SST Records headquarters and Manson was in prison. Working through correspondence, the duo created a full album together called Completion and pressed five copies, but SST ultimately shelved the project after receiving death threats. Rollins kept two copies of the album, and played a selection of the material to the audience at the Echoplex. "I can hear you all listening to your hair grow," Rollins said when the chilling track was done. Perhaps now would be an ideal time for SST to release this long-lost artifact. After all, Magic Bullet Records announced earlier this year that they would be releasing a four-album series from Manson, beginning with the Air LP that dropped in August.